As part of ArabLit’s coverage of the 2015 International Prize for Arabic Fiction, we will be interviewing authors and reviewing the 16 titles on the shortlist. Three years of Arab revolutions and fast-moving political events distracted Sudanese novelist Hammour Ziada, who lives in Cairo, from completing his second novel Shawq Al-Darwish (Longing of the Dervish). Frequently, he would feel unsatisfied with his work and stop writing. At one time, he stopped for seven months and decided to cancel the project. Longing of the Dervish finally found its way to print in June 2014, and it won the Naguib Mahfouz prize in December of last year. Earlier this month, it was also longlisted for the International Prize for Arabic Fiction. Mahmoud Mostafa: Your second novel won Naguib Mahfouz prize then it led you to the 2015 International Prize for Arabic Fiction (IPAF) longlist. How do you feel about that? Hammour Ziada: It’s a burden, of course. I never dreamt of quick success — let’s call it an “explosion of success.” This scares me. I always appreciated the success that comes rooted in experience through passing years and productivity. I didn’t imagine that this explosion would happen to me, but this the way of our time. With spreading media and prizes, here my second novel has found its way into translation while it took twenty-five years for the first translation of a Mahfouz novel, and it was his sixth. MM: How do you see the diversity of nominations for this year’s prize, ten Arab countries and five women? HZ: This is a good diversity, but – of course as you notice it is still in the orbit of countries with a rooted novel tradition and a strong presence in the Arab cultural scene: Egypt, Syria, Iraq, Morocco, and Lebanon. Eritrean literature misses out, also Somali and Mauritanian, and these are Arab countries with authors who write in Arabic. For example, there is the Eritrean Hajji Gaber. I’m awaiting such a diversity. Algeria missed this year, Kuwait kept a place with one, there’s one Yemeni novelist, and one Sudanese that is me. Before me, Dr. Amir Tag El-Sir was the only Sudanese nominee. Eritrean literature misses out, also Somali and Mauritanian, and these are Arab countries with authors who write in Arabic. For example, there is the Eritrean Hajji Gaber. I’m awaiting such a diversity. MM: Which nominated works have you read and which caught your attention? HZ: I read Graphite (Hisham Al-Khashin), The Size of a Grape (Mona Al-Shimy), Sharp Turning (Ashraf Al-Khamaisi), Floor 99 (Jana El-Hassan) and the American Neighborhood (Jabbour Douaihy). Among them are some distinctive works. MM: In your interviews, you talk about the richness of Sudanese literature. What do you think makes for its distinctive nature? HZ: First of all, the language. Sudanese eloquence, as it differs from one region to another, hasn’t been consumed for reading yet. Also the Sudanese style is full of poeticism, in addition to the world the Sudanese culture belongs to, where African and Arab cultures mix. MM: The Longing of the Dervish features a discontinuous narrative style. Did you write in a regular time sequence then started disaggregating and sifting? HZ: I wrote the novel as it is, with its disordered broken time sequence. I had a specific context in mind for setting the time this way. I bet on the chaotic narration to be an attractive factor, because when you tell a story, you have to pick the best of styles from your own perspective to attract your audience. If the novel was written in a classic cumulative style, maybe it would have been just a Sudanese version of [Alexandre Dumas’s] The Count of Monte Cristo or any other universal novel about vengeance and impossible affection. MM: In the novel, Maresila’s father is said to be a jinni. 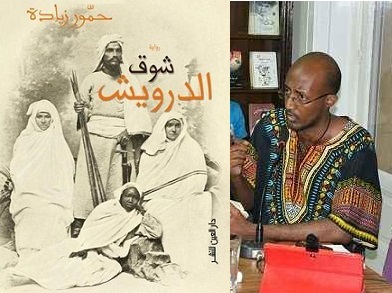 Could it be a link between The Longing of the Dervish and Sudanese novelist Abdel Aziz Baraka Saken’s The Jingo, that features the same supernatural element? HZ: These are novels that come from the same distinctive Sudanese cultural world. You’ll find jinn in The Longing of the Dervish and The Jingo, living dead in [my first novel] The Kong, and in Khalid Oways’s novelKeyah, and you’ll find Sufi sheikhs walking on the water and multi-locating in Tayeb Salih’s The Wedding of Zein, and in my works. This is a one cultural environment. MM: You are the second Sudanese to be longlisted for the prize after Tag El-Sir in 2011 and 2014. Are there other Sudanese novelists you see coming to the IPAF lists or to the wide Arab arena of attention? HZ: There are number of names who can compete and progress if provided with the right circumstances. There is Baraka Saken, and he is an established novelist and he has a project. Also there are Mansour Al-Suwaim and Rania Ma’amon. Adam Sandler: It’s Time To Grow Up!